For most people, iodine deficiency can cause low thyroid hormones leading to high cholesterol, low energy levels, tiredness, and feeling depressed(1) (2). However, iodine deficiency during pregnancy is a harmful condition associated with miscarriages and stillbirths. Babies of mothers who had iodine deficiency during pregnancy are at a higher risk of having physical disabilities, learning difficulties, and brain damage(3). Iodine is a mineral that forms part of the thyroid hormones, thyroxine, and triiodothyronine. The purpose of these hormones is to regulate our metabolism and maintaining healthy connective tissues. Connective tissues include bone, bone marrow, blood, skin, teeth, ligaments that link bone to bone at joints, and tendons that connect bones or cartilage to muscle. During pregnancy, thyroid hormones are also necessary for the normal development of the baby’s brain and nervous system(4). In the early 1990s, the WHO and UNICEF recognised iodine deficiency as a major preventable health risk, even in countries such as the UK(5). Researchers have found that iodine deficiency is re-immerging as a worldwide problem(6). A recently published study on iodine deficiency in pregnant women in the South-West England found that 73% had low iodine levels(7). The UK Government recommend 140 µg of iodine a day for all adults to prevent iodine deficiency(8). This included pregnant women and women who are breastfeeding their babies. However, WHO and UNICEF recommend that pregnant women and breastfeeding mothers should have 250 µg of iodine a day to ensure healthy iodine levels for both the mother and her baby(9). A healthy diet can provide the WHO and UNICEF recommended daily iodine intake. 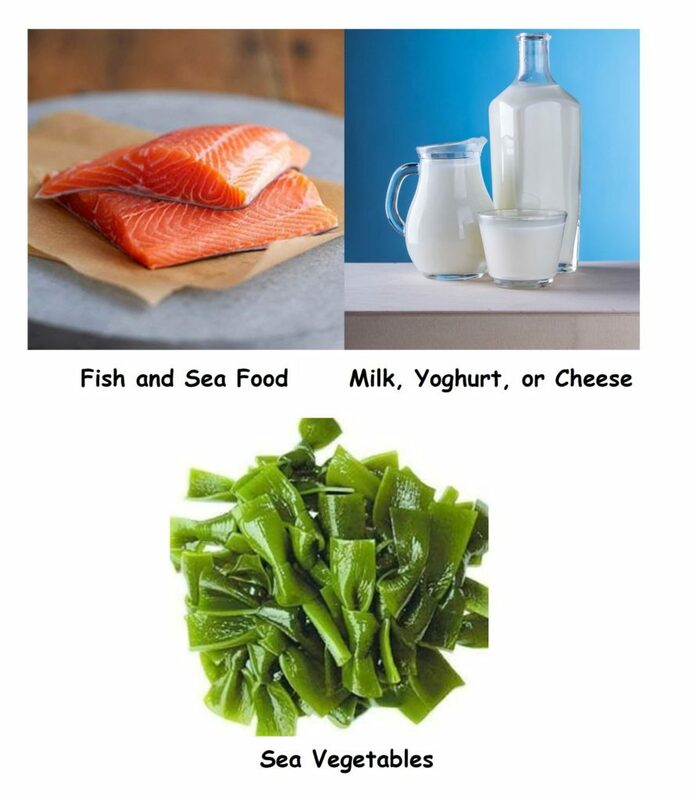 The best sources of iodine are sea fish, sea vegetables (such as kelp, kombu, nori, and wakame), and iodised salt. However, sea salt is not a good source of iodine. Cow’s milk is also a good source of iodine due to the iodine content of cattle feeds and the use of iodine-containing liquids for sterilising heat prior to milking. Unfortunately, organic cow’s milk has half the iodine content of non-organic cow’s milk due to the use of non-iodised cattle feed. Some foods can suppress thyroid hormone levels and cause a goitre when the diet is low in iodine. These include soybeans, peanuts, walnuts, corn (maize), cassava, potato, cauliflower, and broccoli. FNC Events: Courses and workshops in nutrition for optimum maternal health?